Asked what could be inferred about the work of the Creator from a study of his works, the British scientist J.B.S. Haldane is reported to have replied ‘an inordinate fondness for beetles’. Other unsourced variants on the theme, are: The Creator, if He exists, has ‘an inordinate fondness for beetles’. 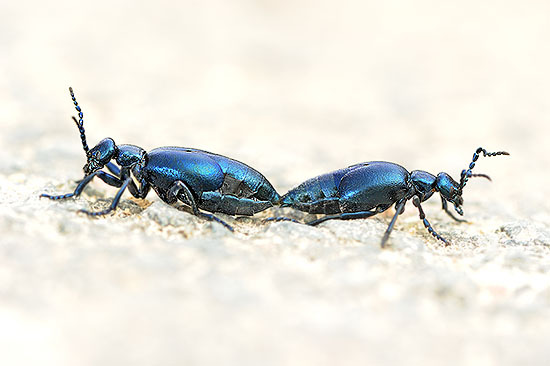 Beetles or Coleoptera, as they are known in scientific circles, inhabit every possible niche, from the polar ice caps to the broad expanse of rain forest canopy, from the flat lowlands to the highest mountain ranges, and from arid deserts to lush wetlands. By the most conservative estimate, approximately 350.000 species have been described by now. This is about a fifth of all described living organisms and a fourth of all animals. 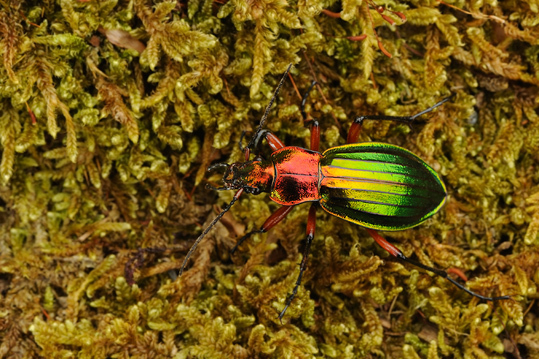 Fact is also that still many of the beetle species haven’t been described yet, as a lot of species living in remote areas or high in the canopy, remain waiting to be discovered. Within these vertiginous numbers, almost all ecological strategies and adaptations are found. Some of the most outrageous weird designs and spectacular colours or drawings in animal kingdom are encountered within the Coleoptera. It is this amazing diversity designed for strategies of behaviour, defense, reproduction, and addaptation, which has been appreciated since the time of the Pharaohs. My own fascination for beetles, started about 25 years ago when I was looking under logs to find fire salamanders, and I accidently came across two beautiful large carabid species. When I shifted to digital photography, getting good images from ground beetles in their natural habitat soon became a personal project. 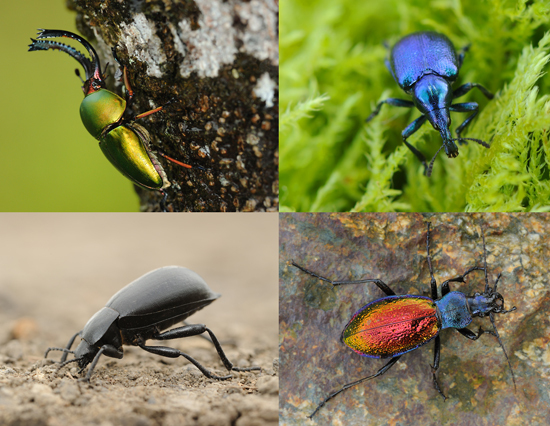 I quickly found out that there are many other fascinating beetle families, which deserve my ongoing attention. ‘The beginning of wisdom is calling things by their right name’ Krishtalka, China. ‘Biologists will never be sure that they have found and named every last species on Earth. But they have a long way to go before they can even start to wonder’ Nigel Stork and Kevin Gaston, New Scientist, 1990. For me, identifying a beetle is often only the start of my vain attempts to understand the fascinating life and ecology of the particular species. When I’m lucky I am able ‘to give the species the correct name’, read more about its ecology and observe some of its habits in the field. Unfortunately, the availability of good books or internet fora on particular beetle families is still very limited. Concerning the beetles occurring in regions outside Europe or the United States of America, finding books is a real disaster. Even for these continents the literature about some beetle families is often limited, let alone the knowledge itself. When reading about well studied groups, such as Carabus species, one realises that even about these families there are still huge lacks of knowledge. 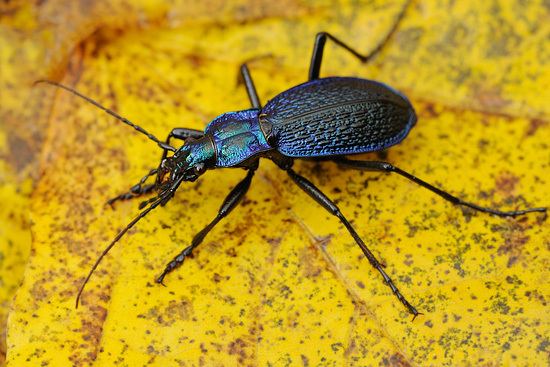 What are the true ecological demands of many Carabus species during their larval stage? Is this the reason why a species is locally very abundant to vanish almost entirely for several kilometres, despite the occurrence of at first sight suitable habitat? Or is it the competition with other species who limit their population? Do tiny habitat differences make the species more vulnerable for predators? Are there subtle microclimatic differences which we don’t notice and if so, do they affect the adults or the larvae, or simply the prey densities? I often encounter more questions than answers. 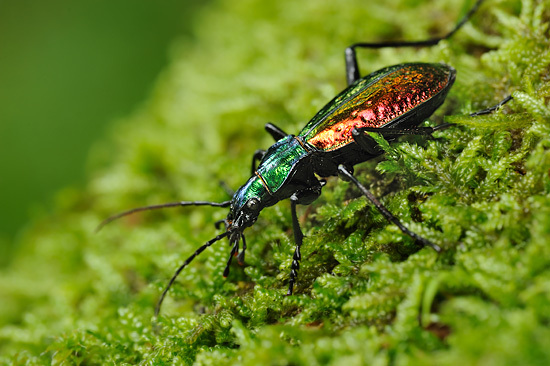 For the past 230 million years, beetles have been predating, chewing, digging, running, swimming and flying trough a continually changing landscape. They will keep on doing so, whether we inventorise and study them or not. Despite this relativity and despite the almost desperate mission of obtaining once complete beetle inventories, the fascinating world of beetles deserves our attention. Better knowledge and insights into the beetles diversity can certainly help us to enhance some of the nature conservation efforts and can lead to a better management of our natural resources. 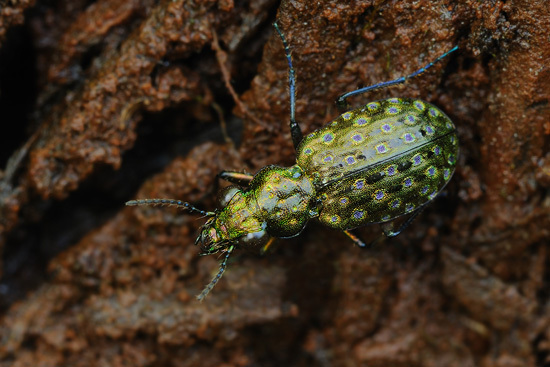 Some beetle species have such mind-blowing appearances that these tiny insects can even help to increase the public support for some conservation goals. This said, despite my feeling of still knowing very few about beetles, I can still be surprised by beetles in an almost childish enthusiastic way. 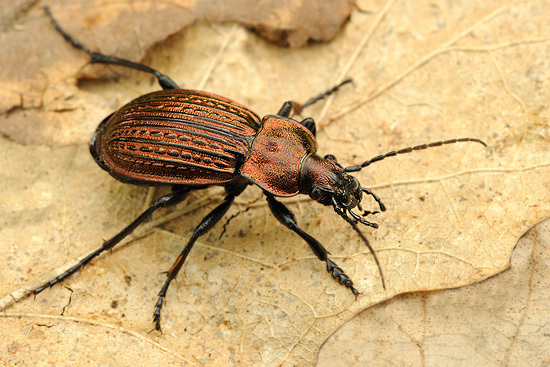 On my blog, I’ll regularly list up some fascinating facts or stories about beetles. By making good images of beetles I hope that some people will take a moment to marvel at these fascinating creatures. Blueprint of the worlds beetle diversity. 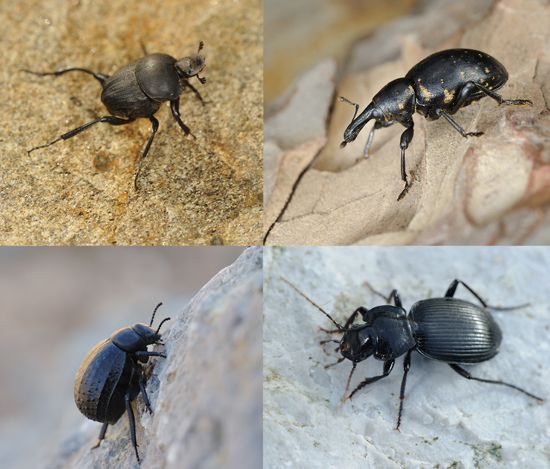 Here are some images illustrating the striking difference between several families and the variations found within the world of beetles. The images under here illustrate the variety of designs and ecological strategies. From left to right, clockwise: 1. Sisiphus schaefferi, a dung rolling beetle living in extensively grazed meadows and pastures of Spain - 2. 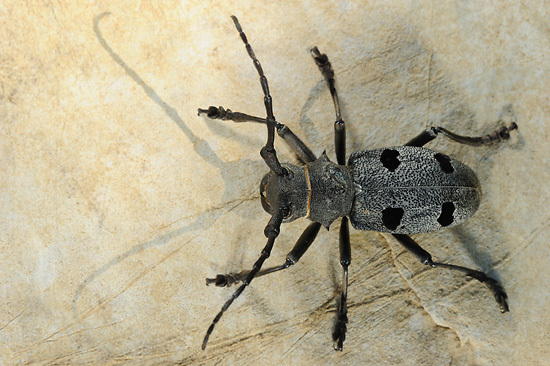 Liparus glabirostris, a large weevil species found in the Central European forests - 3. a Darkling Beetle (Tenebrionidae) living in the rocky deserts of North Africa - 4. 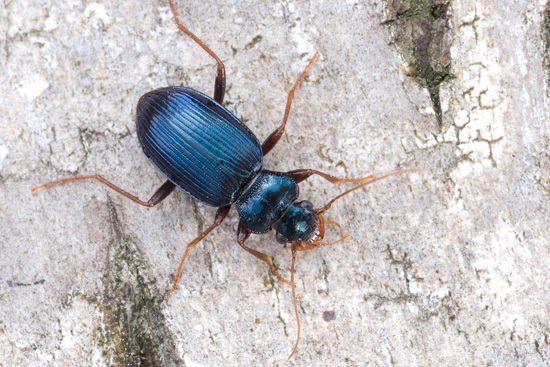 Licinus hoffmannseggi, a ground beetle found in European mountain forests. Now I'll try to illustrate that within the same families, there is a huge variation of colours, drawings or patterns, and even the entire design and shape can be very different. So you can compare image 1 from above with image 1 from underneath, both are members of the Scarabaeoidea. Same when comparing image 2 to 2, both are weevil species, etc... Image 1, under here, is a jewel stag beetle found in the forests of West Papua. Image 2 is Byctiscus betulae, a leaf-rolling weevil. 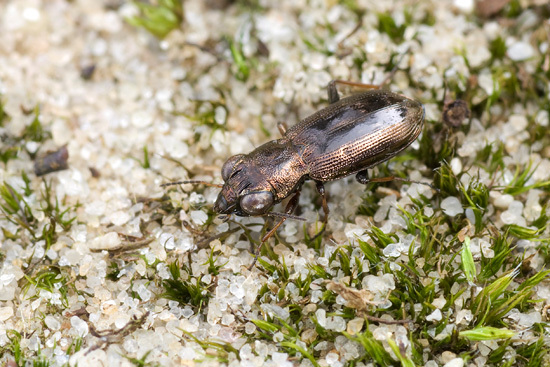 Image 3 is a darkling beetle found in the Pannonian steppe, and image 4 is a Carabus hispanus, a large endemic ground beetle from France. This means that, on top of the striking differences between the different families, you can sometimes observe almost as striking differences between species belonging to a same family. Under here, two images illustrating the huge size variation. 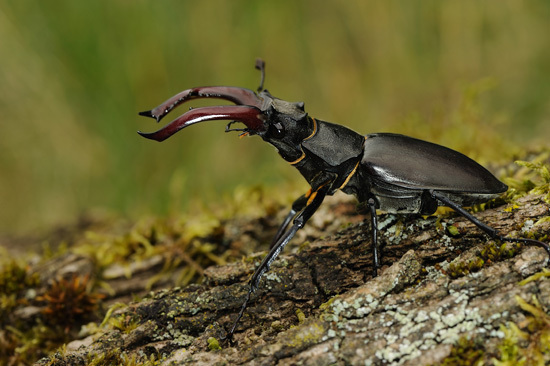 The first image is the Stag beetle, Lucanus cervus, the largest beetle found in Europe (up to 9 cm). 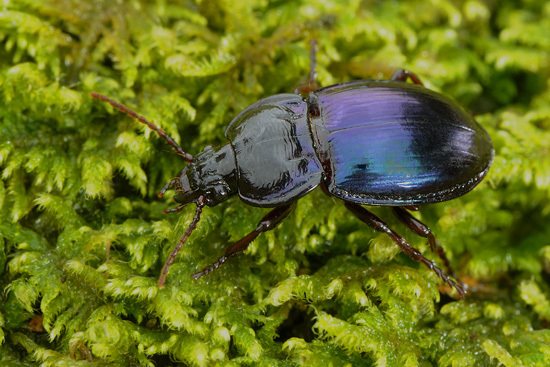 The second image shows a tiny ground beetle species, Notiophilus rufipes, which has a size of about 4 mm. Some tiny beetles are only 1 mm large, and some Longhorn Beetles found in French Guiana, such as Titanus giganteus, have a body size of up to 20 cm! Under here a cryptic Jewel Beetle and a very flashy one. 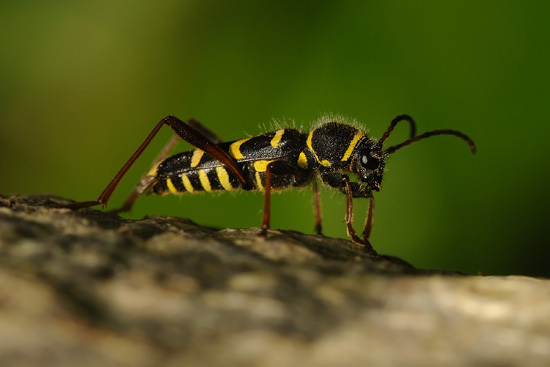 Under here an image of a Longhorn Beetle species, Clytus arietus, a good example of a beetle mimicking a wasp. Under here some extra images, to illustrate that on top of all the above mentioned diversity, there are still loads of beetles species, and families with other forms, designs and patterns. 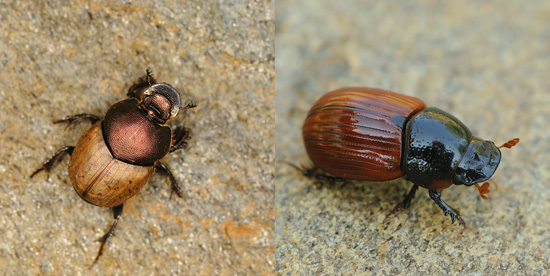 On the left a Clown Beetle, at the right a Click Beetle. Under here two members of the Chrysomelidae, Leaf Beetles. Under here two dung beetle species, Onthophagus coenobita and Aphodius fimetarius. Under here, a Trichodes apiarius, a beetle which parasites during its larval stage on bees. At the right a Rose Chafer species, Protaetia ungarica. Under here, two Longhorn beetle species with a beautiful pattern and shape: Chlorophorus trifasciatus and Rosalia alpina. 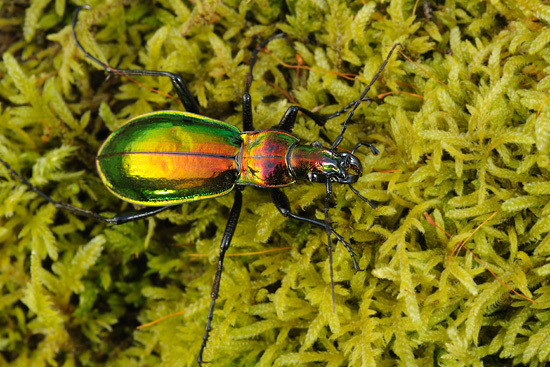 Finally, I will try to illustrate the mind-blowing variation and diversity within the Ground Beetles - Carabidae. Under here, images of more cryptic and subtle coloured species. 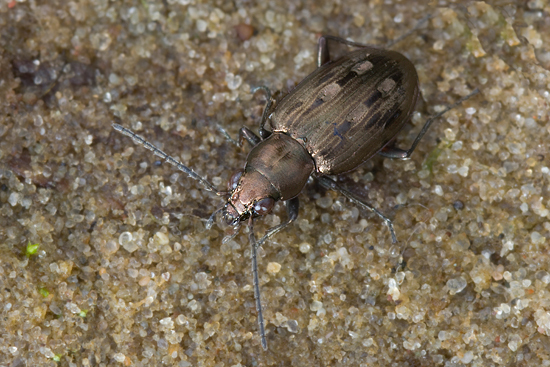 First a small Bembidion littorale, which hunts on small sandy shores of large rivers. 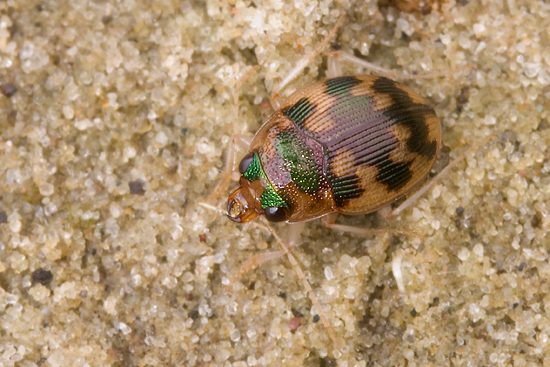 It is followed by an image of Poecilus lepidus. Under here, two forest species: Leistus spinnibarbis and Myas chalybaeus. Both are striking blue species, but with totally different shapes. 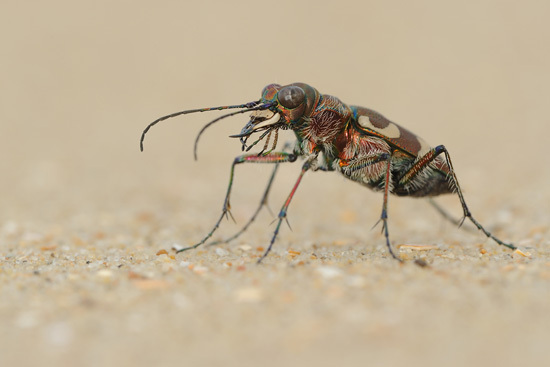 Now the colours and patterns are starting to get really flashy, under here a tiger beetle, Cicindela hybrida and Dinodes fulgidicollis. 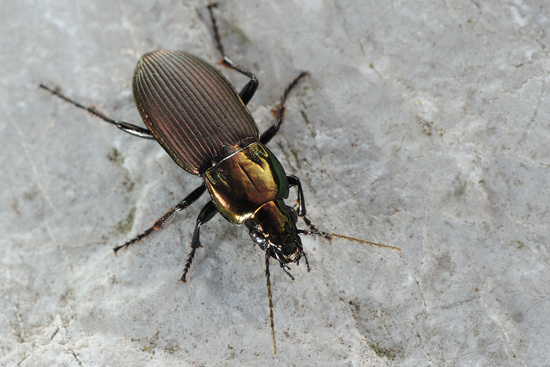 Within the large Carabus species, the dorsal patterns and the colours are often very striking. Under here Carabus ullrichi, splendens, intricatus and rutilans. 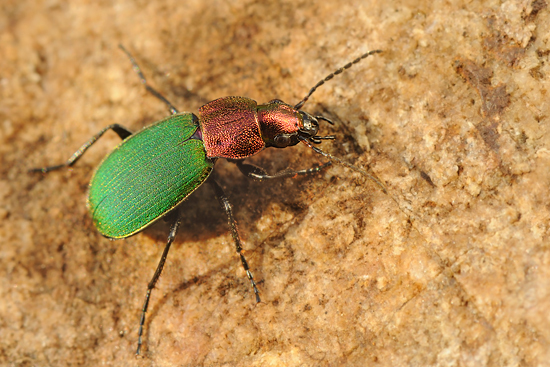 I'll end with one of my favourite species, the Elaphrus uliginosus. It is a tiny beetle, only about 6 to 8 mm large, hunting on old peaty grasslands. Its dorsal pattern could have been designed by an Art Nouveau architect. So far I have images of about 500 beetle species and most of the images were made in Western and Central Europe. So the diversity that I tried to illustrate is still based on a very limited image collection. This means that my image collection only illustrates one on each seven thousand of the known species. So by scrolling through the images above, keep in mind that I only illustrated a few species, and that my collection of images is still limited. It is as if I would have given you an explanation about the diversity of red wines in a supermarket, but the final goal is to get an idea of the diversity of all products, not only in the specific supermarket where you are standing, but in all the supermarkets of the world. Keep this metaphor in mind, and you will come close to capture the beetles' diversity. I don't have the ambition to illustrate as much as possible species, but it would be nice to be able to get images of many more of the stunning species. I have no idea which are all the species I will encounter on my fieldtrips in the future, but I'm sure my quests will lead me to fascinating places and the beetles will keep on surprising me. But to summarize, I have the same feeling as the scientists, who 'have still a long way to go before they can even start to wonder'.